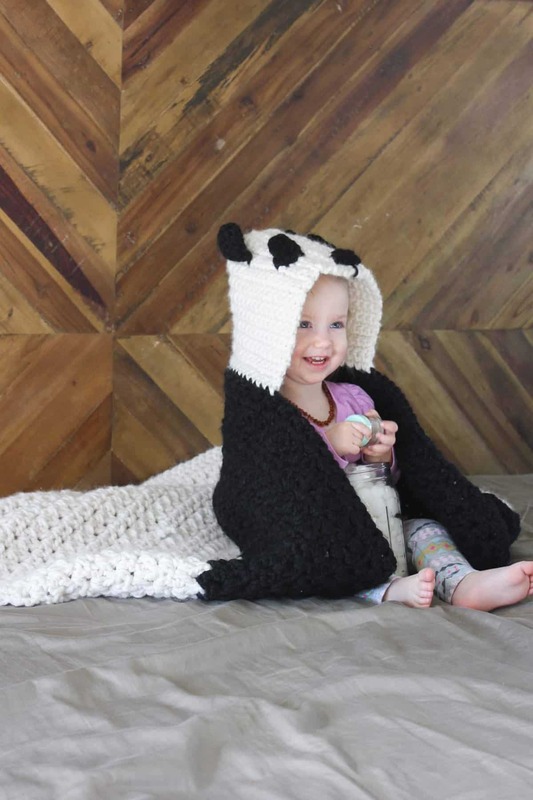 This free hooded baby afghan pattern will give your favorite child the chance to feel like a cozy little panda. Make one for the new baby to grow into and another for an older sibling to enjoy right away! Fun, form or function? When giving gifts to my friends who are expecting, I’m always torn between giving something totally indulgent (hello, mini “baby” record player), something beyond adorable (hello, miniature UGG boots) and something super practical (hello, diapers). Since I’ve been in the position of an expecting mama before, I know the inexplicable joy getting some of those items you registered that are just straight up necessary for life with a new baby. 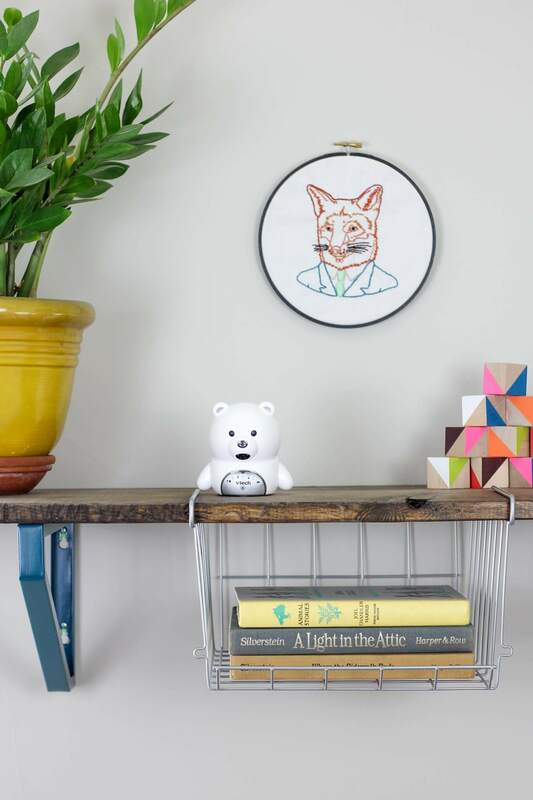 I also know how touched I’ve felt by each of the thoughtful, handcrafted DIY gifts that my friends and family have poured their creativity and time into for my kids. 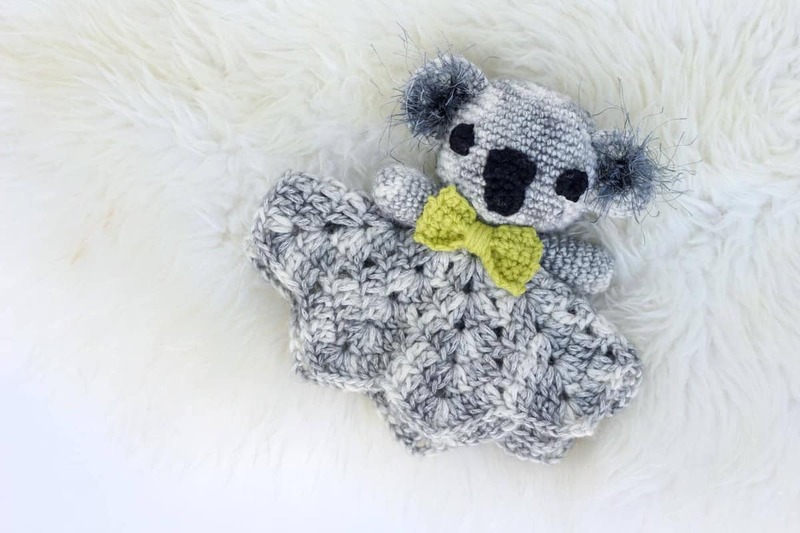 I started to wonder if you could give a baby gift that brings the parents piece of mind everyday AND a handmade gift that is pure, indulgent cuteness? 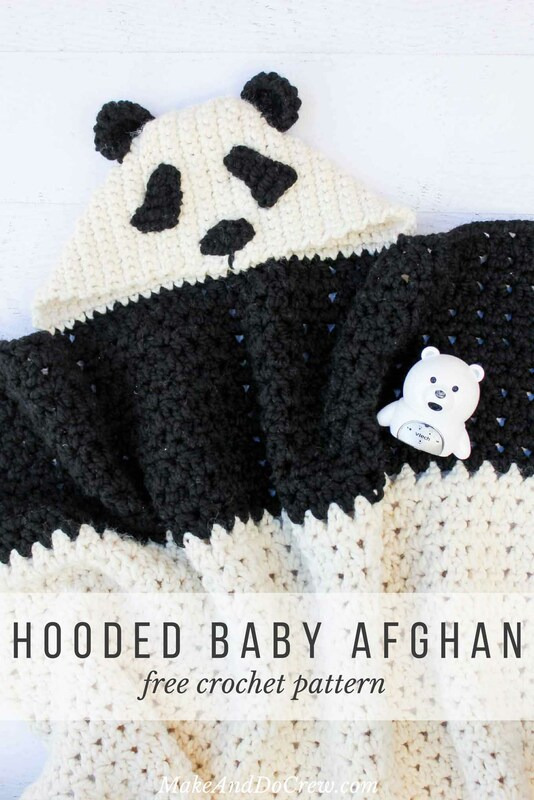 So, I designed this panda hooded baby afghan pattern to pair alongside a VTech VM341-216 Bear 2 Camera Full Color Video Monitor to check all the gift-giving boxes with one sweet bear-themed gift! 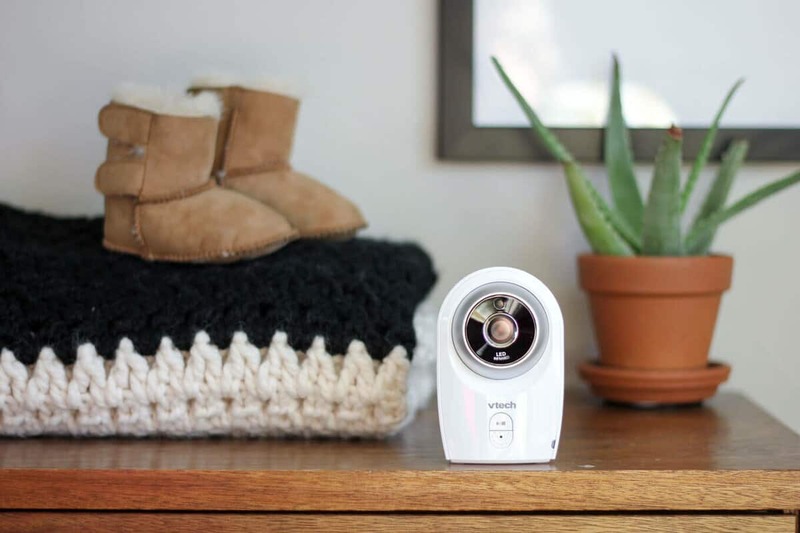 The VTech Bear Video Monitor comes with two clear, high-quality cameras, which makes it a perfect gift for a family that wants to keep their eyes on two different spaces. In our case, this means we can have a camera in both of our daughters’ rooms and only need to carry (read: not lose) one monitor. Because let’s be honest, simplification is the best gift you can give parents! After seeing how much both of my daughters enjoyed this hooded baby afghan, I really think it would be wonderful to gift a set of these to a new baby and their big brother or sister. 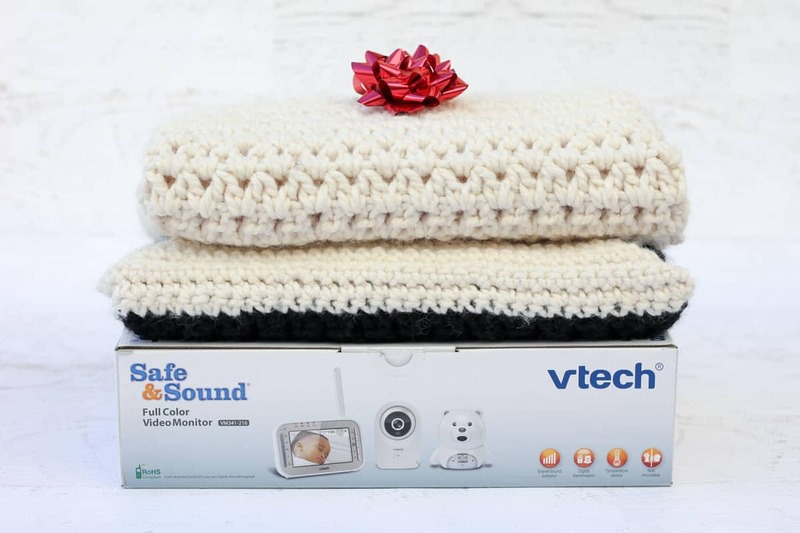 Since the VTech Bear Video Monitor comes with two cameras, why not make two blankets too, right!? I am curious what this pattern would be like worked in a worsted weight yarn with a smaller hook. I suspect the scale might be great for a younger baby. 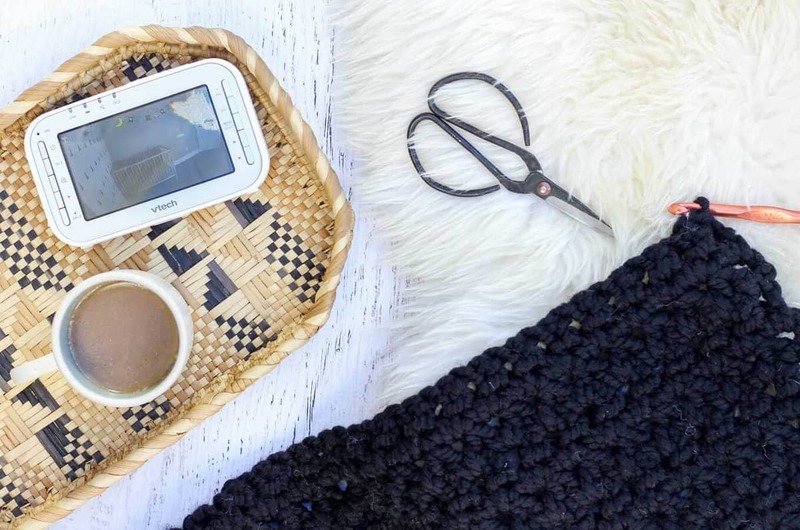 To gift your own perfect pairing, you can find the free crochet panda baby afghan pattern below and pick up a VTech Bear Video Monitor exclusively at Babies R Us! Purchase the printable, ad-free pdf of this pattern for $2.75 here. So you can spend more time making pandas and less time shopping, this pattern contains affiliate links at no extra cost to you. 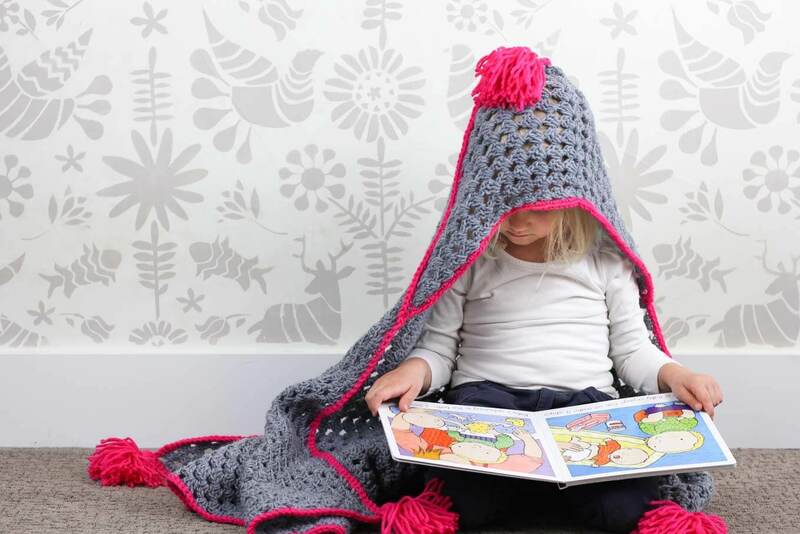 The heft and size of this hooded afghan make it the perfect size for a toddler or preschooler. It would likely be a bit too large for a newborn. 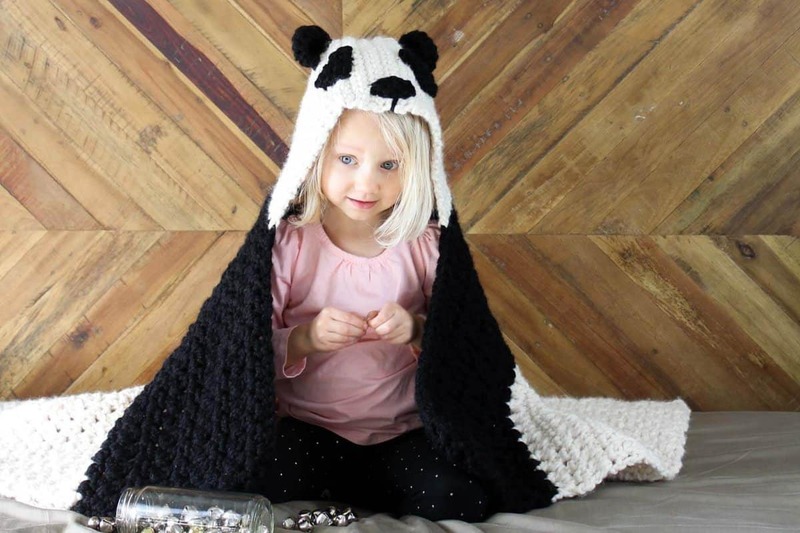 This pattern is intended to use all the yardage of two skeins of Wool Ease Thick & Quick in “Black.” Since each skein’s exact yardage can vary a little, it’s smart to work the black facial features for the panda first so that you can ensure you don’t use too much black yarn on the afghan and run out of yarn for the face. Using SC and smaller hook, ch 7. Row 1: Dc in third ch from hook, 1 dc in each of next two ch, 1 tr in next two ch. Fasten off, leaving a long enough tail to sew eye patch onto hood. Repeat for second eye patch. Using SC and smaller hook, ch 4, sl st into first ch to form a ring. Row 1: Ch 3, 9 tr in ring. Fasten off leaving long enough tail to sew ear onto hood. Scoot all stitches toward one half of the ring. Using SC and smaller hook, ch 6. Row 1: Sc in second ch from hook, working one st per ch, dc, tr, dc, sc over next 4 ch. Fasten off leaving long enough tail to sew nose onto hood. Notes: Reference chart below for visual guidance. Row 2: Ch 3, dc2tog over 1st and 2nd dc from hook, *ch 1, dc2tog by inserting hook in next 2 dc; repeat from * to last dc, ch 1, dc in last dc; turn. Row 3: Ch 3, dc2tog over 1st and 2nd ch sp, *ch 1, dc2tog by inserting hook in same ch sp as last st, then in the next ch sp; repeat from * working 2nd leg of last dc2tog under tch of previous row, ch 1, 1 dc in 3rd ch of same tch; turn. Row 3-21 (or until 5 skeins of “Fisherman” are used): Repeat row 3. Switch to SC and work remainder of blanket. Row 22-30 (or until remainder of SC is used): Repeat row 3. Notes: Using larger hook and mc, join yarn in 26th st at top of blanket. 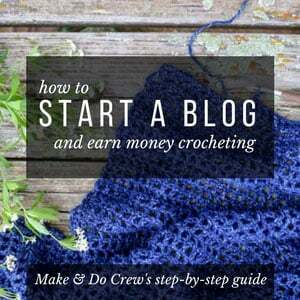 (To attach yarn for hood, create a slip knot around hook. Insert hook in 26th st from the edge, yo and pull yarn through slip knot.) Work row 1 over tail of slip knot to avoid weaving it in. With tapestry needle and SC tails of facial features, sew the ears, eye patches and nose onto the hood as pictured. Alternatively, you can use black sewing thread if you find it easier to work with. Wrap up your favorite child in a big “bear” hug! 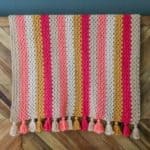 « Modern Corner To Corner Crochet Christmas Afghan – Free Pattern! Can you recommend a smaller size hook or less rows for a newborn?? I’d love to make this for a pregnant friend but I think she’d love to put it round her baby asap! I think that making it with a worsted weight yarn and the appropriate hook (probably like a j-ish) would make a great size for a newborn. 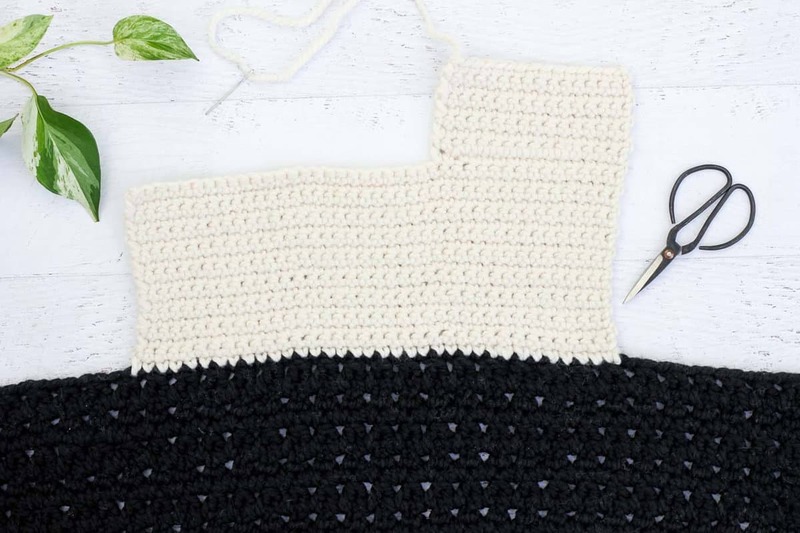 You could do a little swatch with whatever yarn you want to use and see if it scales down the pattern gauge in a way you’re happy with. Does this type of stitch have a name? 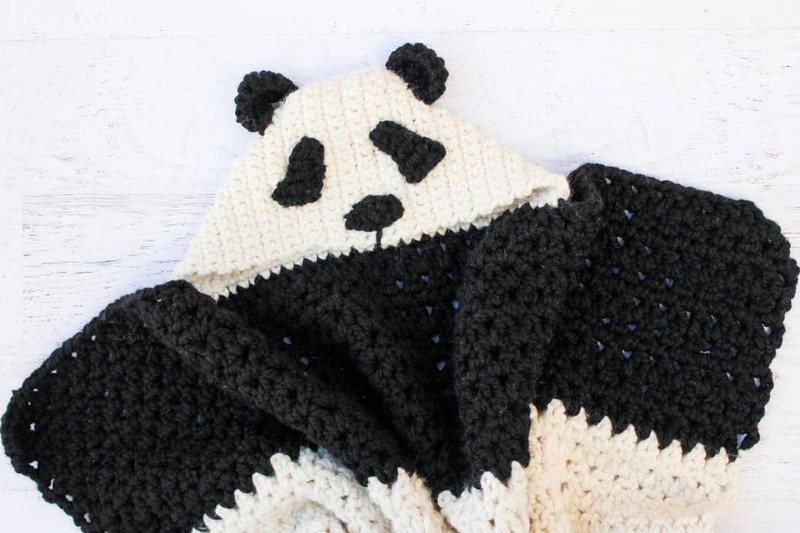 Got yarn and cannot wait to start this for my panda loving little man, but I am a visual person unless I already know the stitch. I can understand that. 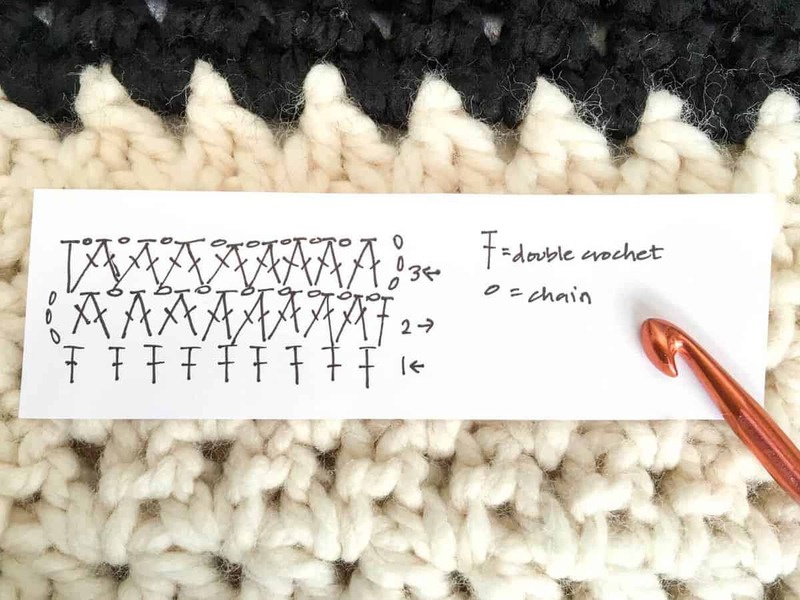 It’s called “staggered double crochet pairs.” While I don’t have a video for this stitch right now, you might find that looking at the chart within the pattern helps guide you. I’m a pretty visual learner and I really love charts! Do you think that doing 2 strands of worsted weight yarn verses the thick and quick would work up OK on this pattern? Maybe lighten it a bit too? I think it would def work, although it might make the blanket a bit smaller. Even if it was a smaller though, I still think it would be totally appropriate for a toddler! Do you think using 2 strands of worsted weight yarn would work up OK with this pattern vs the thick and quick? I think it would! 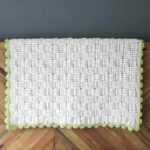 The gauge might be slightly different (you might want to check ahead of time) so you might end up with a smaller blanket, but the overall effect will be the same. If you find that two strands isn’t thick enough, three might work well. I’d love to make one for myself 🙂 I find a hood is the best thing to keep me cozy when I feel sick, so this is the ideal yet! Any suggestion to adapt this for an adult size? I love the Panda blanket! My daughter is crazy over pandas, so I know she will love it too. This is the first time I’ve been on your site, and I’ve seen lots of great patterns. 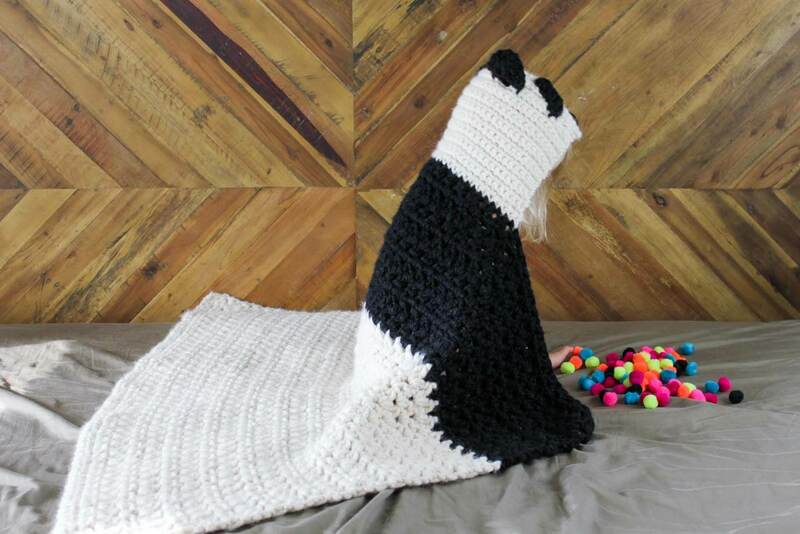 Thank you for the free Panda blanket pattern, and for ALL the patterns you share wit all of us. Such an adorable pattern. Is there any way to increase it for an adult? I’m still pretty new to crochet, and don’t know how to make things bigger without instructions. This would be absolutely perfect for a gift for one of my good friends. Thank you in advance. Hi! 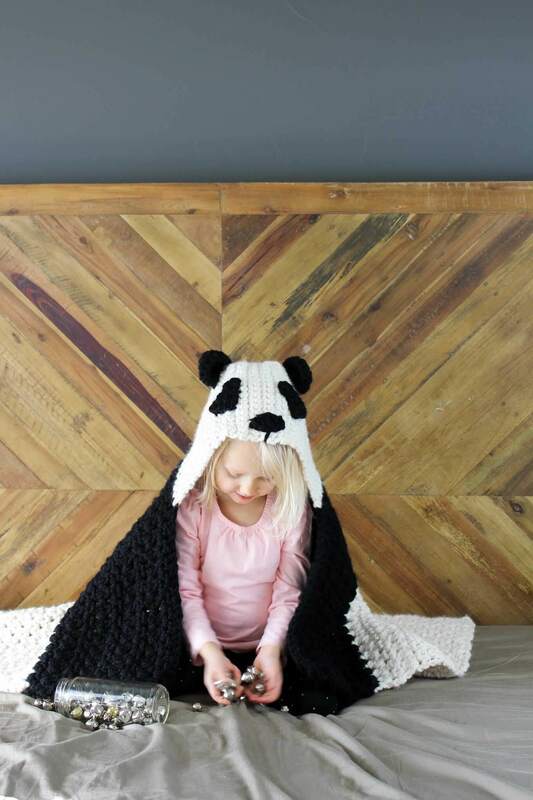 Thank you fo the pattern, I would like to do this for my older daughter (23) commonly called Amanda Panda, how can I increase the pattern for an adult. Tks for your help. In row 3 of the blanket, it says “working 2nd leg of last dc2tog under tch of precious row, ch 1, 1 dc in 3rd ch of same tch; turn.” What is a ‘precious row?’ I haven’t been crocheting for long and so far I’ve never come across this term? Haha. Well, that is just a typo! 🙂 It should say “previous” row. No matter how cute a blanket pattern is, none of the rows are precious, lol! Thanks for bringing that to my attention, Holly! I think this pattern is adorable! Which edges of the upper hood do you join? Could you please mark the photo of the flat hood with A and A , B and B or symbols of your choice? I just am not getting that part. Thanks Letitia! So the taller rectangle part on the right side of the photo should become the top of the hood when folded over. If you fold it toward the left, the side of that top rectangle will face the back of the hood. If you orient your piece like mine is in the photo, lift up that top rectangle and fold it toward the left. What an adorable pattern. Any suggestions on making it for an older child? Increasing the starting chain by 10/20 stitches? My blanket is looking as if it is starting to get smaller as I add rows… am I doing something wrong? I’d suggest counting your stitches each row for a little while and see if you’re somehow eliminating a stitch somewhere. 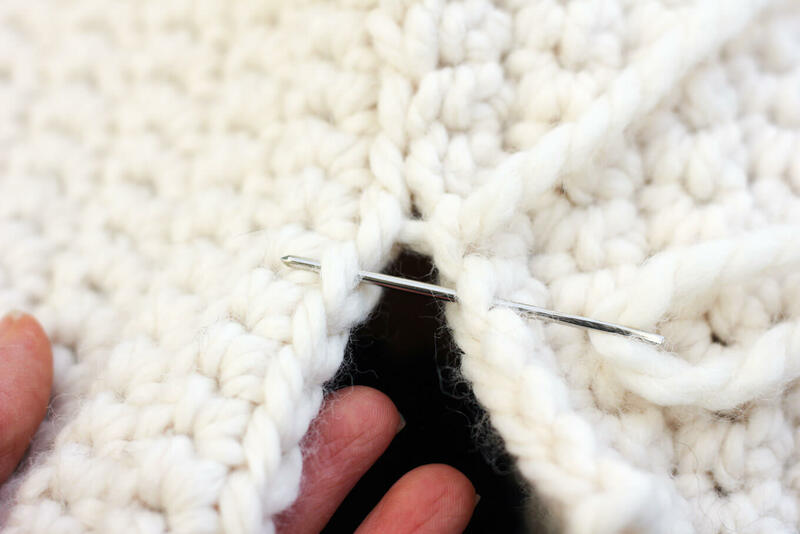 Figuring that out can tell you if something’s going wrong or if maybe your stitches are just getting a little tighter as you work. Thanks for posting this! I love pandas and would like to make a blanket for me. I am still new to crochet, would it be possible to tell me how many more stitches you need to increase to make an adult size blanket. 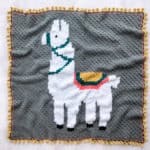 Thanks so much for another wonderful pattern. I just finished it and it’s fantastic! Say, I don’t mean to be critical, but if you use up all the white yarn in the blanket body, you don’t have any left for the hood. I was crocheting on a road trip and so ripping back a bunch wasn’t a big deal, but when it says in rows 3-21 to keep going until 5 skeins are used up, I think maybe it should just be 4. I’m just trying to save someone else a little time! It’s really a great pattern and super clear and I bet with a little foresight, other people have successfully avoided this problem. Thanks again. Love the pattern, finishing it up now. If you are revising, here are a couple of things I picked up… I used 6 skeins of white, 5 for body, 1 for hood. Also, needed 2 skeins of black. Your pattern indicates you need you need approx 212 yards which is 2 skeins.